So, I blog. Am a blogger. Or a blobber as my MIL once called me, I think by accident. Aside from blogging for myself, I blog for other people too which feels quite different because I have to make sure I don’t swear and I very nearly always use a spell-checker. I don’t really write about blogging too much simply because the majority of you aren’t bloggers (makes sense right? ), but I’ve got a few tips and thoughts on blogging that I’d like to share with any bloggers who do read this. Rather than do some big ol’ preachy post about it, I thought I’d drip-feed a few tips here and there to help clear my brain of the “blog fog” that is never far away. If you’re on WordPress *watches 3/4 of you hit the back button*, there’s a great plugin that really helps me quickly schedule my blog posts. WordPress Calendar appears in the dashboard as a month-by-month calendar format and allows you to add a draft post simply by clicking on the desired day. I’m not explaining this very well, let me throw in a picture. This shows last month’s blog schedule and you can see just how “at a glance” it makes things. I can schedule weeks in advance without having to count on my fingers (not that I’m ever this organised) and I can locate future posts and edit them quickly. 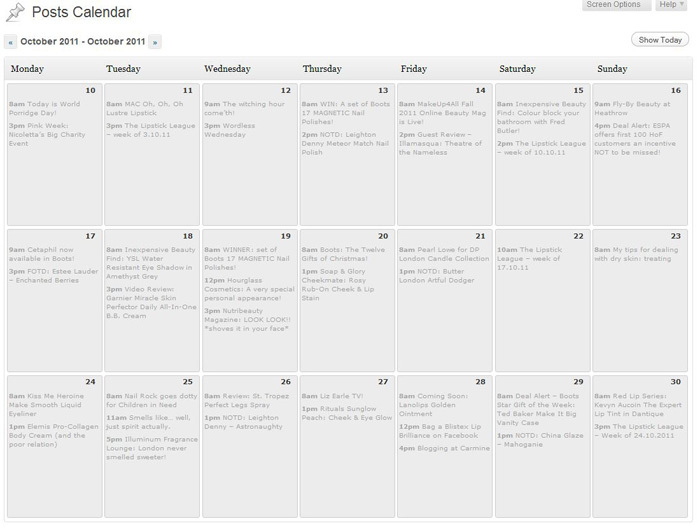 If you’re on WordPress and blog frequently, I really recommend the WordPress Editorial Calendar. thanks for this, i would love more blogging tips from you. ur tempting me to switch to wordpress! I’d love more blogging tips! I’ve never blogged before so the knowing the basics would be really helpful- like what sites to sign up with, whether to get your own domain etc. I vote for more blogging basics!!! If you blog on blogger and want to switch to wordpress, do you lose your blogger stuff? Late response is late, but I think Blogger has an export tool that helps you keep all of your old posts while transferring to a new blogging platform. Ooh this is brilliant! I’ve been plotting posts on Google Calendar and then scheduling them in WordPress. Never even thought to look for a plugin. Thanks for the tip! I know this isn’t the point of your post but I’m still laughing at blobber…..heeheee! I have mine done up on a spreadsheet, because 1) I don’t use WordPress; and 2) I’m more than a month out; but without some kind of editorial calendar, I’d be so very very lost!!! I’m with Jane on this one, blobber sounds like something my dad would say! I’m a novice blogger and I’m on wordpress. I’m trying to get my perfume blog up and running at a regular place. Usually I just blog on the fly every other day. I’m afraid I can’t keep this up any longer because I have accumulated so many perfume samples to review, I’m starting to forget what I’ve reviewed and what I haven’t! This wordpress editorial seems like the ticket! I need to get myself more organized and plan ahead! Thank you for imparting your blogging wisdom!